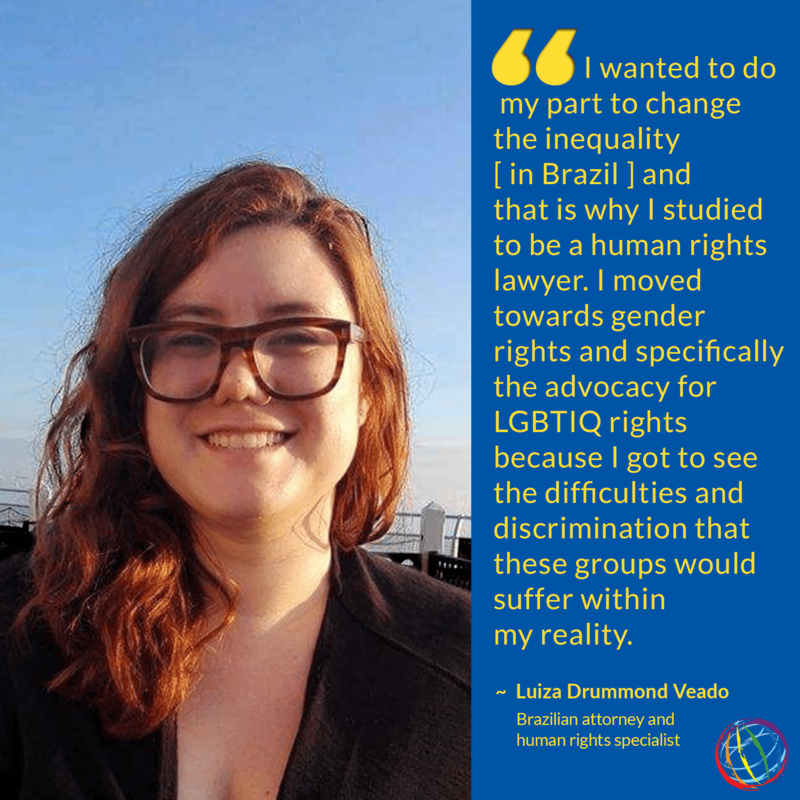 Luiza Drummond Veado is currently a Fellow of the Rapporteurship on Rights of Lesbian, Gay, Bisexual, Trans and Intersex Persons of the Inter-American Commission on Human Rights. In addition to being a Brazilian attorney and human rights specialist, she is also an International Human Rights Law LLM candidate at the University of Essex. Luiza: I come from Brazil, a country filled with inequalities and ambiguous discourses. From an early age I got to see the effects of the discrimination and inequality on everyday life. I wanted to do my part to change this inequality and that is why I studied to be a human rights lawyer. I moved towards gender rights and specifically the advocacy for LGBTIQ rights because I got to see the difficulties and discrimination that these groups would suffer within my reality. At the same time that I could notice the enormous fetishization of the LGBTIQ bodies, especially those of women, those bodies were treated as second class citizens, with no political and economic participation. During my LLM I got the opportunity to do research on LGBTIQ issues and even to participate at a LGBTIQ moot court. I got the Fellowship at the LGBTI Rapporteurship of the Inter-American Commission on Human Rights right after finishing my final exam on my master’s program. This is an opportunity that I’ve got learn more on the issue, since I get to monitor and promote LGBTI rights in the entire continent. Luiza: Working for an International Organization, State action and global politics influence directly the direction that my work takes. The current setback in the region, with the so called “gender ideology” campaigns, laws that discriminate LGBTIQ people and the high levels of violence and cruelty against LGBTIQ people, mold what I need to focus on. Luiza: To me, advocacy week is an important moment to connect with what is happening in other parts of the world, with different organizations and different perspectives. I believe that I still have a lot to learn on how to be a better advocate and that I can bring what I have learned so far to the table. New perspectives can improve my work at the IACHR and will allow me to bring new tools to address different topics in my own work. Luiza: Currently, as stated above, the main social and political obstacle that the work of the organization faces is the positioning of States against the protection of LGBTIQ rights. There is a strong discourse strengthened by some religious groups that doesn’t recognize non-heterosexual families and that demonizes LGBTIQ groups and people. Moreover, the lack of information and official data on the existence of LGBTIQ persons and the human rights violations they suffer in the American continent.